Cooler weather has arrived in Florida; the kind of weather that makes you eager to turn off the AC and throw open windows and doors. However, the bugs come right in along with the cool air. The answer to this problem has been available for homeowners for quite a while now: screens. Unfortunately, many owners of historic homes no longer have their original window and door screens. Because window screens are easily removed when in need of repair, they usually get stacked in the garage and added to the bottom of the To Do List. Wood screen doors typically get removed directly to the trash. The result is both a loss of historic character and a loss of comfort and function. While the majority of wood window screens tend to be similar in design, the wood screen door has a greater degree of design variety to suit various architectural styles. The screen door also is subject to much more daily wear than the average window screen. Add Florida’s high humidity and temperature fluctuations and you do have to spend some time thinking about screen doors if you want them to look appropriate and last for a reasonable amount of time. Although basic wood screen doors are available at local home improvement stores, they are rarely suited to historic homes or to Florida’s climate. Many of the available screen doors are built of finger jointed, soft woods with narrow frames. The result is an oddly proportioned door that tends to sag and stick shortly after installation and rot within a season or two. They also are available only in stock sizes that often need to be modified in order to fit existing historic door openings. A better, longer lasting solution is to install a custom built screen door that is designed to complement the architectural style of the home and built of rot resistant materials using durable joinery techniques. Screen door styles range from simple rectangular frames suited to vernacular homes to ornate ginger-breaded doors for Victorian era homes. Several designs are available for the Craftsman-influenced and Mission style homes so common to Florida as well. Materials such as cypress and dense pine are suited for wood screen doors in Florida due to their rot resistance and dimensional stability. Strong joints, such as mortise and tenon connections add to the strength and durability of screen doors as well. 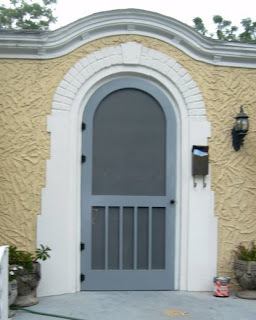 Finished with period-appropriate hardware, a well designed and built wood screen door can add character to a historic home and serve as a welcome to Florida’s wonderful winter weather.